The Rock Warrior’s Way: Mental Training for Climbers, first published in 2003, outlines the foundation of the Warrior’s Way ® material. 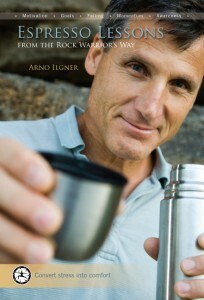 Espresso Lessons takes the material into practical climbing situations. It is the “how to” application of The Rock Warrior’s Way, intended to build upon and complement it. Mental fitness training is simply improving your ability to keep attention in the moment. The most challenging—and interesting— moment in rock climbing is when your mind doubts whether or not you can continue climbing. Knowing when it is appropriate to push through this doubt and when to back off is critical for taking appropriate risks. Espresso Lessons helps you take appropriate risks. It is an intentional approach to risk-taking that includes very specific processes for gathering information, assessing risks, making risk decisions, and taking effective action. Many climbers ignore or avoid falling. Espresso Lessons addresses falling head-on, through intentional falling practice. It also includes specific exercises to practice all phases of risk-taking, allowing you to integrate the Warrior’s Way ® material in a practical and tangible way. Espresso Lessons takes The Rock Warrior’s Way® material into practical climbing situations. It is the “how to” application of The Rock Warrior’s Way, building upon and complement The Warrior’s Way.